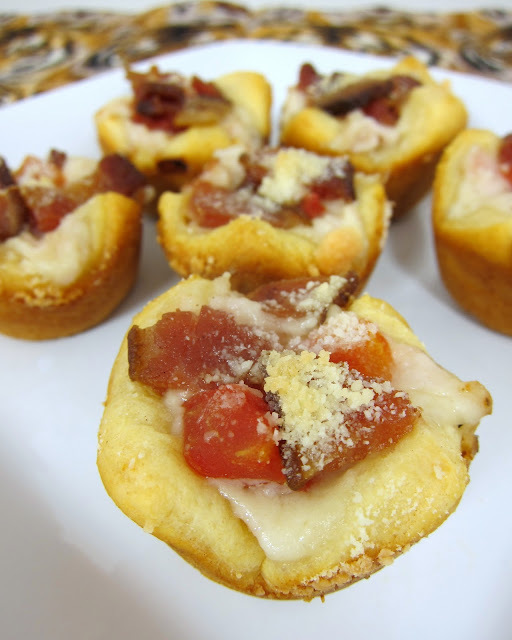 Kentucky Hot Brown Bites - turkey, bacon, tomatoes and mornay sauce baked in mini muffin pan - perfect for your Derby Day parties and leftover holiday turkey! I had my first Kentucky Hot Brown at Bobby Flay's Bar Americain in NYC last year. It was AMAZING! I made a mental note to recreate it at home, but I haven't gotten around to it until now. This version was inspired by the Club Sandwich Puffs I made earlier this year. We really liked the little bite-sized sandwiches and decided to turn the Hot Brown into a bite-sized treat too. We ate these for dinner, and there were no leftovers. This is a great way to use up any leftover turkey from Thanksgiving, and they would be the perfect addition to your Iron Bowl tailgate on Saturday!! Melt butter in a heavy-bottomed saucepan over medium-high heat. Stir in flour, and cook, stirring constantly, about 1 minute. (Do not let mixture brown.) Add milk, whisking constantly. Bring to a low boil, and cook, stirring constantly, about 2 minutes more. Season with salt, pepper, and nutmeg. Remove from heat, and stir in cheese. Allow to cool slightly. Preheat oven to 350ºF. Lightly spray mini muffin pans with cooking spray. In a small bowl combine finely chopped turkey and mornay sauce. Lightly spray a mini muffin pan with non stick cooking spray. Unroll crescent rolls and press dough into one large rectangle. Cut rectangle into 24 squares. Press dough squares into muffin cups and shape up around the edges. Fill each muffin cup with some of the turkey mixture. Top each bite with some diced tomato, bacon and parmesan cheese. Bake 13-15 minutes or until lightly browned. Oh, you are a woman after my own heart!! These look SO good! I've SEEN Bobby Flay in his "Throw-down" Food Network show with the two chefs who do this in the south, and I have ALWAYS wanted to make a Hot Brown. How lucky you had one at his restaurant! And your little bites look so delicious. Thanks for sharing! I love love love love KY Hot Browns so I know I'll enjoy these miniature ones. 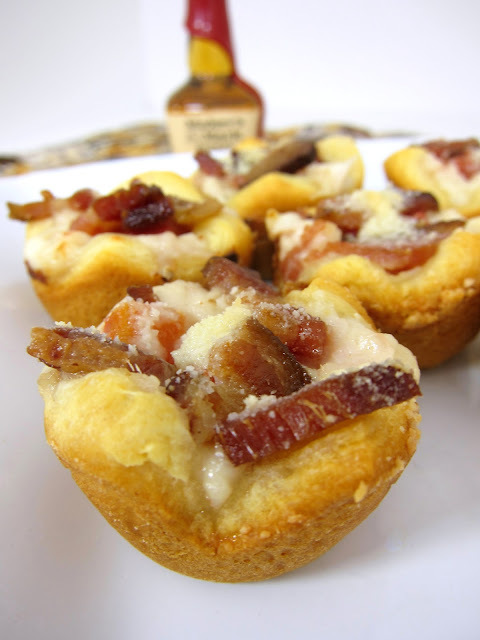 I've never tried hot browns, but these muffin-sized versions look incredible… love the photos! Am I supposed to use two squares of dough per muffin cup or just one? Mine seem to barely cover the bottom of the muffin cup. Mandy - I used one piece per mini-muffin cup. You can try rolling the dough with a rolling pin to make it fit. Not a fan of packaged crescent rolls--- any other suggestions? going to try these but have a question - do you add the tomato before baking and how long & at what temp to do bake? Patty - add the tomatoes before baking and bake them @ 350 for 13-15 minutes. Yum! These look delicious! Great for leftovers! This looks good! I will have to try it especially since I am from Louisville, Kentucky the home of the hot browns. Thanks for giving us creative ideas for snacks and meals. Love this idea, is it possible to make these the day before and heat the day of a party? I am trying to do some things in advance.